Mary Jane Gates or Mary Reuter Gates? In an earlier blog, I had posted a photo of a young woman who I thought was Mary Jane Gates, my mother's first cousin. I had good reason to think it was her. 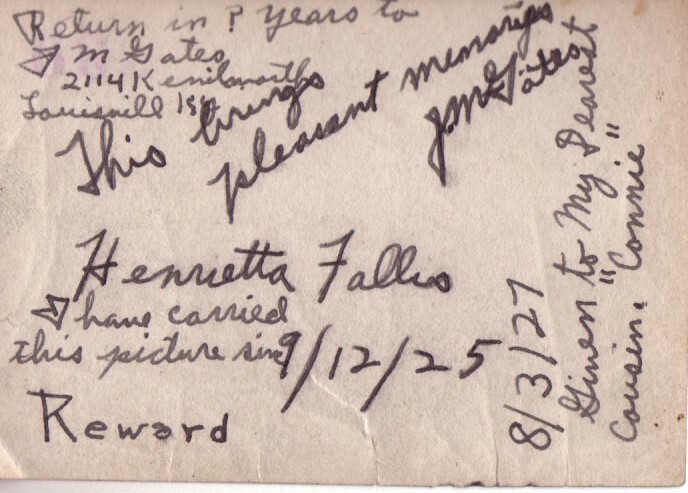 There were captions on the back which, even though written by teen-agers, and in somewhat indecipherable handwriting, seemed to indicate who the person in the photo was. That is, if you are thinking in terms of captions that people write on the back of photos. Then recently, I got a match on 23and Me of a second cousin, daughter of who I thought was Mary Jane Gates in the photo. She introduced me to her sister, who is also our new second cousin. My new dna match and her sister descend from our grandfather's (Augustus J. Gates) brother, Albert Gates and his wife, Alvina Knapp. The supposed Mary Jane Gates, in the photo, was Albert and Alvina's daughter. I was so happy to show my new cousin and her sister this photo. Only trouble was, she said, "that's not my mother." "My mother didn't live in Louisville, KY, and did not go to Atherton High School." To prove it, she sent me a photo of her mother. She was right! She knew what her mother looked like! This is a photo of our new cousins' mother, the real Mary Jane Gates. Then who was in the first photo? "Maybe it's Mary Reuter Gates," our new cousin said. 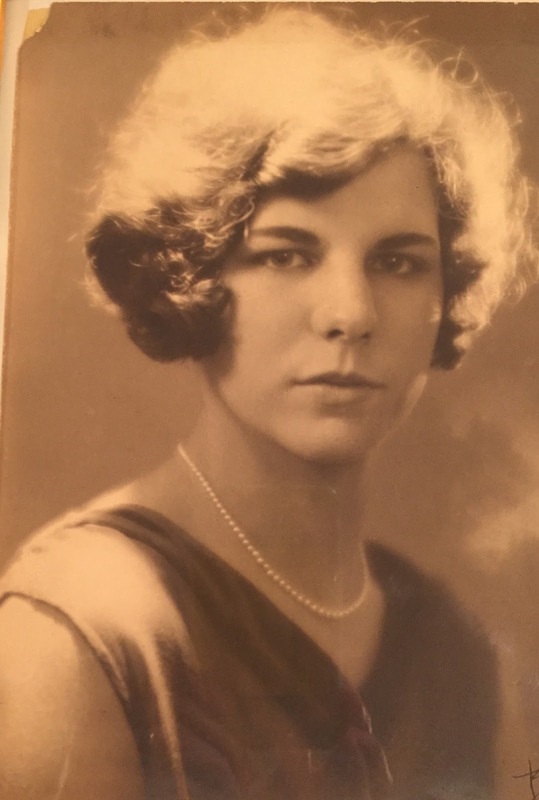 Mary Reuter Gates was another of our mother's first cousins. Mary Reuter Gates was the daughter of John M. Gates, one of our grandfather's other brothers. So I went back to the original photo and tried again to figure out what the cryptic words on the back meant. "Return in ? years to [J?] M Gates 2114 Kenilworth, Louisville, KY. This brings pleasant memories. Jane? [or J.M?] Gates. The address says: "2114 Kenilworth, Louisville, KY." Mary Reuter Gates' family DID live in Louisville, KY. And 2114 Kenilworth turns out was their family's address on the 1930 census. 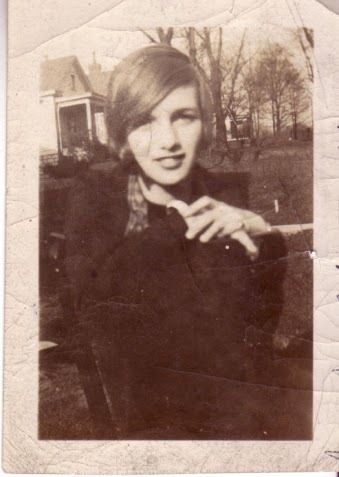 Was she saying return this photo to "J.M Gates," meaning her father's address: "John M. Gates"? There are so many other possibilities of what the signatures could say. Mary Reuter could have been going by a nickname, "J.M." Gates. The first initial "J" might be an arrow pointing to the name. Her father, J.M Gates (John M. Gates) might have signed her photo himself. (unlikely). I originally found the friend "Henrietta Fallis" in the Atherton High School year book. Looking there again, I now found Mary Reuter Gates in 1925. She does look more like the original photo. So the photo has got to be of Mary Reuter Gates. On hindsight, I believe that the signatures on the back of the photo are like signatures on yearbook photos, when you sign your name on your friend's photo. And the names are those of friends signing, not captions of the person in the photo. The friends signing it are (first cousin) (Mary) Jane Gates, friend Henrietta Fallis, and it was passed on to (first cousin) Connie Gates. 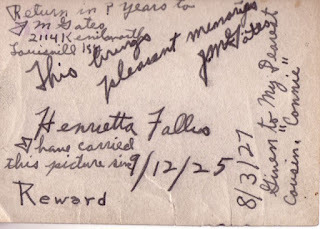 "This brings pleasant memories, Jane Gates" could be Mary Jane Gates' signature on her cousin, Mary Reuter Gates,' photo. Mary Jane Gates did go by "Jane" Gates. What high school cousins would think that their daughters and grand-daughters would someday be struggling to figure out what they wrote on their high school photos? According to our new second cousins, Mary Reuter Gates never married or had any children. 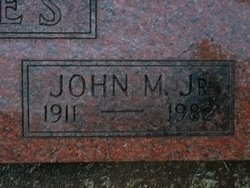 I wondered about Mary Reuter Gates' brother, John M. Gates, Jr., who was two years younger. If only we had some yearbook photos for him! Here is John Gates' senior picture at University of WA, 1934. His listed birth age is 1911 which matches his birth record, 13 Mar 1911, from the KY Birth Index. Could this be Mary Reuter Gates' brother? Social Security Death Index shows John Gates, born 13 Mar 1911 (our John M. Gates' birth date), died in Jan 1982, with a last place of residence, to be Vancouver, Clark, Washington. His SS card was issued in KY, so he seems to be our Gates cousin. Well, he'd be our parents' first cousin and our first cousin, once removed. This John M. Gates, Jr., had a wife, Mary I., and at least one daughter, born about 1940. That means we have another living female second cousin (children of first cousins are second cousins), whose maiden name was GATES, possibly living in WA state. Did she have brothers or sisters born after 1940? Did she have children? And what name might they carry? Does anyone in the family know anything about John M. Gates, Jr. and his daughter? More research for the curious. If ONLY we had some genealogy sleuths in our family living in WA!